Renaissance has been a trusted partner to Irish resellers and their customers for over 30 years. They introduce new, cutting edge and industry leading Data Security and Compliance solutions into the Irish market and have helped implement circa 20 new security solutions over the past 5 years. Now, responding to market pressure and an increased customer demand to understand practical solutions to avoid or recover from cyber-attacks, Renaissance has brought together key global leaders in the cyber solutions space. This 1-day expo will bring together the whole ‘cyber ecosystem’- vendors, resellers, end-user IT experts, and general business thought-leaders, keen to understand what they can do to mitigate security risks to their business. Michael Conway, Director at Renaissance states that “The need for such an event has been evident for some years and with the advent of GDPR and the increased Cyber threats and risks facing Organisations, Renaissance believes that it is our duty as the leading Data Security Distributor in the Island of Ireland to deliver this ‘All-Ireland’ event. The event will differ from traditional conferences allowing for a much more interactive approach for different types of customer to discuss their requirements and find the most appropriate solutions for their needs. Our Exhibitors are among the leading global Data Security and Compliance Software Companies. See demos of the latest versions of their products first hand and assess their suitability for your requirements. Our extensive network in the Security Industry in Ireland means that Renaissance is ideally placed to bring you unique and expert views from the legal, financial, HR and IT professions. Cyber Security impacts ALL areas of business. Discover practical solutions and ways to minimise business exposure to Cyber related crimes with personal advice from our Experts. Our Resellers can discuss the practicalities of deploying data security solutions to ensure Best Practice is adhered to and Compliancy is achieved. For Business Users: Renaissance hope that the fact that it this event is an EXPO, rather than a conference will encourage people to see this as something different. There are a lot of conferences/seminars ongoing on Cyber Security and GDPR related topics, but there is no event solely demonstrating the Solutions that on the market to solve these problems. The internet is great for researching security products and solutions but nothing beats having a real conversation with real people showing the practicalities of using this technology. For Irish Resellers. This event will allow discussions with 20+ global Security vendors; informing, educating and building relationships that will undoubtedly deliver business revenues in the coming months/years. An example of one Vendor : CA Technologies believe they can make a real difference to both Resellers and End Users in the Irish Security market. 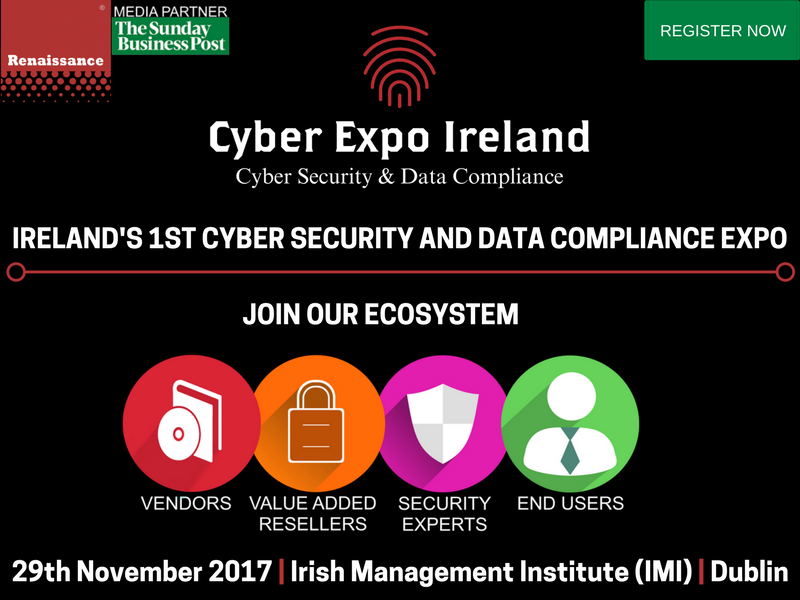 The partnership with CA Technologies & Renaissance, as a Value-Added Distributor has the perfect launch platform at the upcoming Cyber Expo Ireland on 29th November at the Irish Management Institute. We have pre-booked slots with all participants available when you are registering – Avail of these where possible. If you are a Reseller in Ireland – do you need additional solutions for your portfolio? What are your gaps? There is also a C-Level Evening Wine Reception at 6pm – Please contact [email protected] for further information. After a day of serious issues and business risk .. a light hearted conclusion to the day . Colm O’Regan is a critically acclaimed stand-up comedian, columnist and broadcaster. He writes a weekly column for the Irish Examiner and has written for national online and papery publications on both sides of the Irish Sea. Colm is a columnist with RTE Radio 1’s Drivetime, BBC World Service’s In The Balance and BBC World News’ Talking Business. Previous ArticleHow do you have an effective software culture and sustainable success?